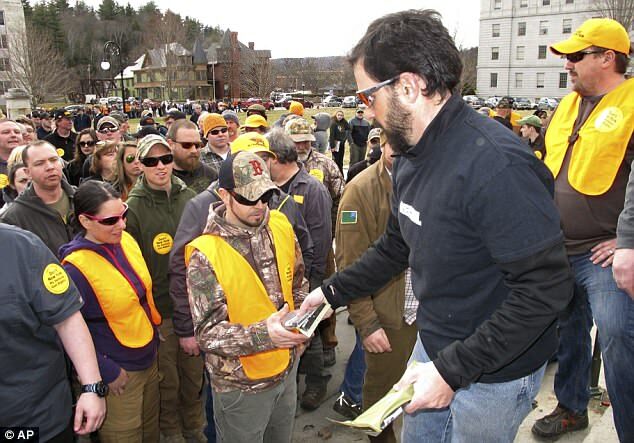 Gun rights activists gave away 1,200 free high capacity magazines at a rally outside Vermont State House to protest new legislation that would ban them and introduce a series of other control measures. 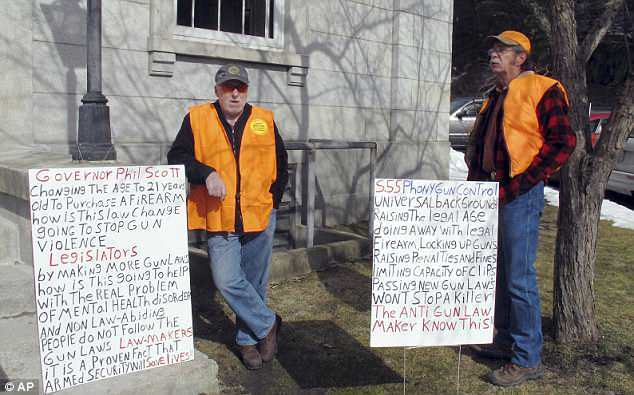 Hundreds of demonstrators turned out on Saturday to urge Republican Governor Phil Scott not to sign the gun restrictions bill a day after it was passed by the state legislature. The legislation would ban the 30-round magazines and rapid-fire devices known as bump stocks, in addition to raising the legal age. It would also expand background checks for private gun sales. Scott acknowledged that many Vermonters would be disappointed by the vote but said he would sign off the measures despite opposing them himself as recently as two months ago. ‘I share it. 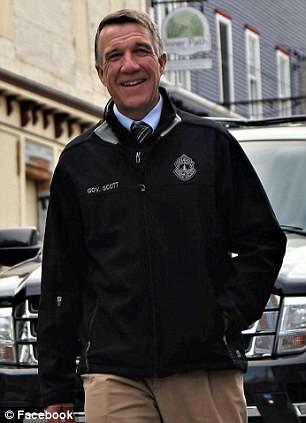 I know why they are disappointed,’ Scott said. ‘But I think at the end of the day, they’ll soon learn that what we have proposed, what’s being passed at this time, doesn’t intrude upon the Second Amendment. Public opinion in the Vermont has been affected by the arrest of a teenager on charges he was planning a shooting at the Fair Haven Union High School, which he once attended. The arrest was made just a day after the shooting at Parkland High School in Florida, which killed 17 people, with tragedy only being averted because a friend of the teenager alerted authorities. About 2,500 students and supporters rallied in front of the Vermont Statehouse last weekend as part of the national ‘March for our Lives’ movement. 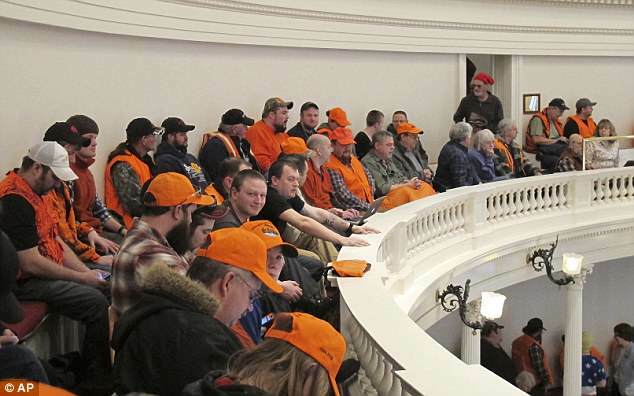 But for the past several weeks, gun-rights supporters, many wearing hunter orange vests or hats, have filled the halls of the Statehouse showing their opposition to gun restrictions. 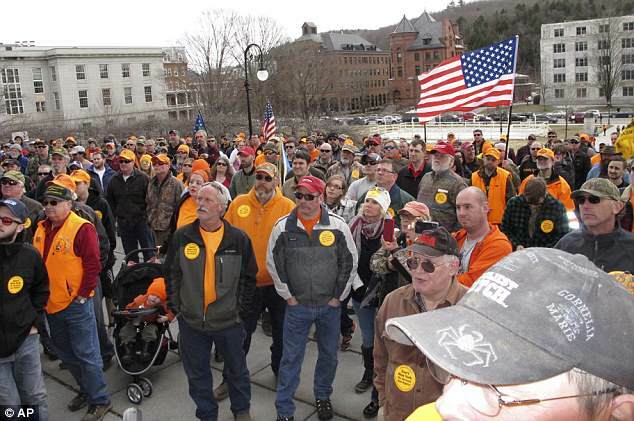 The 17-13 Senate vote on Friday came after an emotional debate in which lawmakers from the largely rural state spoke of the centuries-old traditions that allow people who live far from the nearest police station to keep weapons as a means of self-defense. Others countered that the modern reality of mass shootings demanded change.